In the event of severe weather conditions, the university may announce delays or cancellations of normal campus activities. With winter nearing, take time to review the multiple ways you can stay informed about possible closings and delays. In the event of severe weather conditions, the university may announce delays or cancellations of normal campus activities. With winter nearing, here is a reminder of the university's inclement weather policies and procedures, and multiple ways to stay informed about possible closings and delays. These delays and cancellations apply to the university only. Emory Healthcare employees are sent separate communications regarding inclement weather policies and any delays and/or closures, with details being posted on the EHC intranet, www.ourehc.org. 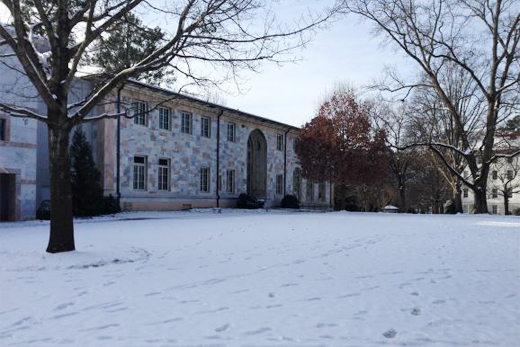 Call Emory's Weather Information Line at 404-727-1234. Text message notification from CEPAR (Office of Critical Event Preparedness and Response). Check the Emory University website. Updated information will be posted to the university's homepage. Watch for an all-Emory email advisory. Social Media: Check the official Emory University Facebook page or @emoryuniversity Twitter feed. Click the "Emergency" icon on the Emory Mobile app for quick access to key phone numbers for one-touch dialing, including Oxford College's inclement weather hotline, 770-784-8400. Download the LiveSafe App for additional information related to winter weather preparedness and other safety guidance. Read more about the university's inclement weather policy.